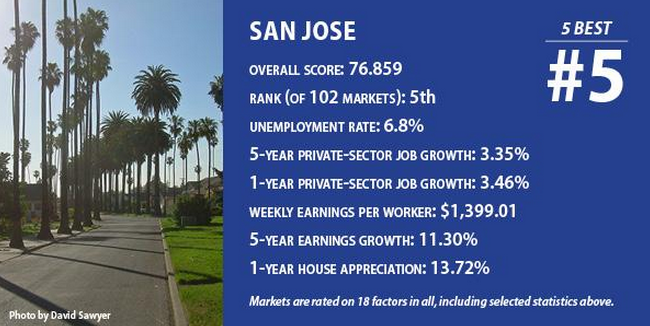 San Jose is the only Californian city to rank in the top 10 local economies list for the whole United States. This study looked at 102 major metros and is based on 18 different components (full details below). 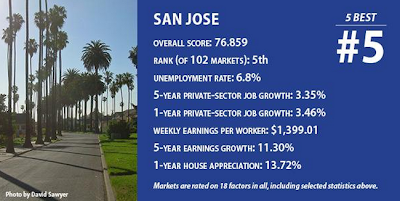 Texas continues to dominate with Austin, Dallas, and Houston in the top 5, but it is nice to see San Jose representing on the list. All raw data come from the U.S. Bureau of Labor Statistics and the Federal Housing Finance Agency, and are the latest available figures as of the second Monday of the current month. • Five-year changes are calculated between the latest available data and the corresponding data for the same month (or quarter) five years ago. • One-year changes are calculated between the latest available data and the corresponding data for the same month (or quarter) one year ago. • Long-term trends are calculated over five one-year intervals: between the same month (or quarter) five years ago and four years ago, between the same month four years ago and three years ago, between the same month three years ago and two years ago, between the same month two years ago and one year ago, and between the same month one year ago and now. Those five percentages are then combined into a single score. • Current rates are the latest rates available. 1. Five-year change in private-sector employment. 2. One-year change in private-sector employment. 3. Long-term trend in private-sector employment. 4. Five-year change in unemployment rates. 6. Long-term trend in unemployment rates. 7. Five-year change in weekly earnings per private-sector worker. 8. One-year change in weekly earnings per private-sector worker. 9. Long-term trend in weekly earnings per private-sector worker. 10. Five-year change in construction-sector employment. 11. One-year change in construction-sector employment. 12. Long-term trend in construction-sector employment. 13. Five-year change in retail-sector employment. 14. One-year change in retail-sector employment. 15. Long-term trend in retail-sector employment. 17. One-year change in house values. 18. Long-term trend in house values. Markets are ranked from top to bottom in all 18 components. The top market in each component receives 100 points; the bottom markets receives zero. Others are evenly distributed in between. Second place, for example, is worth 99.01 points, third place is worth 98.02, and so on. These components count for 5 percent each: 1, 3, 4, 6, 7, 9, 11, 14, 16 and 18. These components count for 2.5 percent each: 10, 12, 13 and 15. Final scores are expressed on a 100-point scale. Separate short-term and long-term scores are also calculated for each market. Both are expressed on a 100-point scale. The short-term score reflects recent movement in the local economy, while the long-term score takes a five-year perspective. Short-term scores are a composite of all one-year changes and current rates: 2, 5, 8, 11, 14 and 17. Long-term scores are a composite of all five-year changes and long-term trends: 1, 3, 4, 6, 7, 9, 10, 12, 13, 15, 16 and 18.